Banana in baking never fails. Till now, not even a single baking dish using banana went to the dust bin from my kitchen. because of this reason, I confidently bake any dish that calls for banana. If you remember, I have posted a lemon curd sponge recipe from weight waters cookbook that I picked from the nearest library. 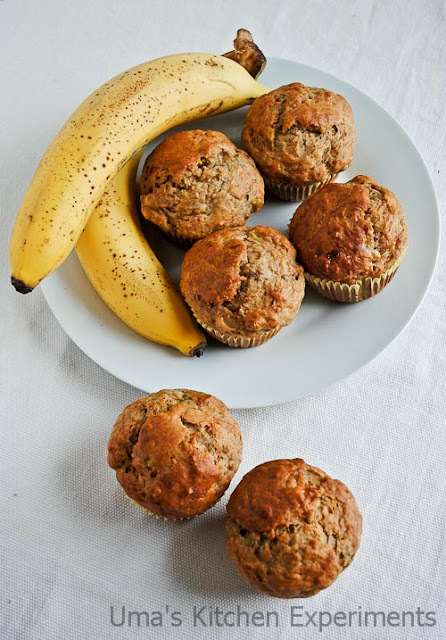 I have also bookmarked couple of recipes from that book including this banana muffins. The recipe given in that book was for 12 muffins and I halved it and baked only 6 muffins for me and the husband. 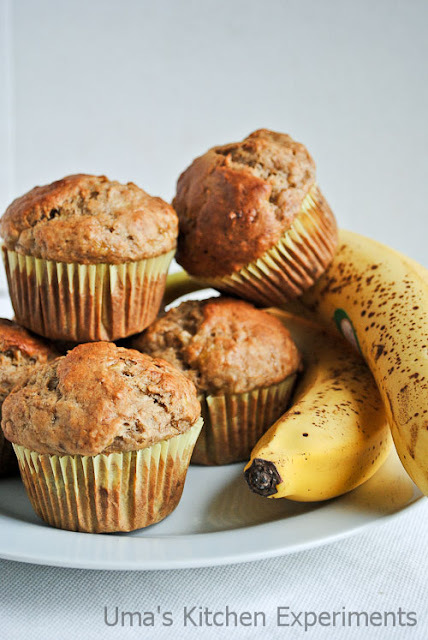 As usual, the result is super soft and spongy muffins with banana flavor. Now to the recipe. 1) Preheat the oven to 190C(375F) for 10-15 minutes. Line the muffins tray with muffins liners. 2) Sift together the all purpose flour, baking powder, baking soda and salt. 3) In another bowl, mix banana, egg, brown sugar, oil, water and vanilla extract. 4) Beat well till all ingredients are properly incorporated. 5) Quickly, add the wet ingredients to the dry ingredients. Just mix to combine. Do not over mix. 6) Pour this lumpy consistency batter to the lined muffin tray equaly. 7) Bake it for 20-25 minutes. Mine was done in 20 minutes. 8) Transfer to a wire rack and cool completely. Hi Mahi, Thanks.. Sure.. will do next time when I bake. Vimitha, thanks dear. Please do let me know the results. Love to start my day with this muffins, suits prefect to have anytime of the day. 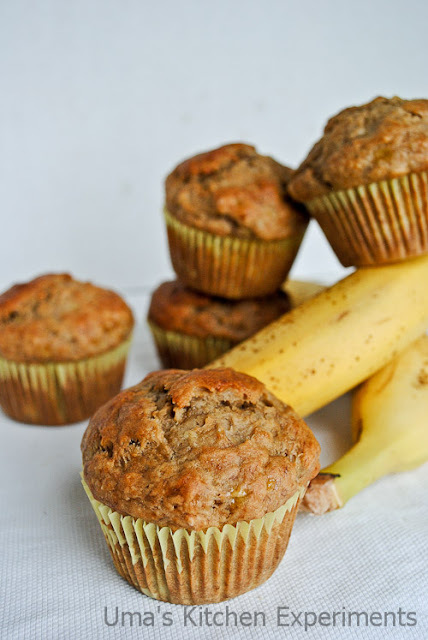 my all time fav muffin :) like banana flavor..
Would love to include these in my breakfast menu's! 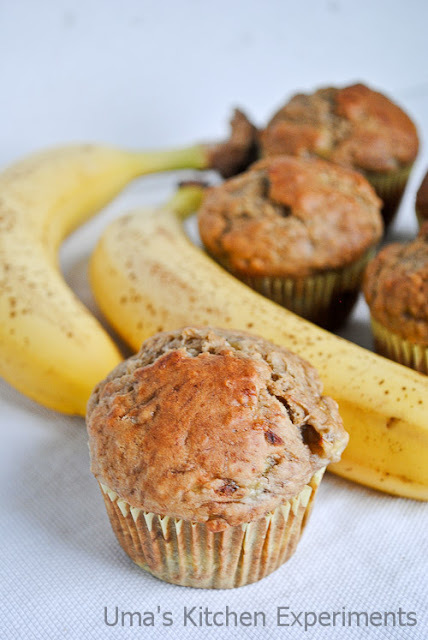 This banana muffin would sure make a delicious breakfast.